Just wanted to put out a PSA about the Lil' Sami bear canister. On June 26th at Marcy Dam, a bear destroyed my bear canister. It was at the northern camp site close to the lean-tos. I have reported the incident to the DEC and HPIC. I got some flak from the HPIC saying that this type of canister is clearly not suitable, but I am completely baffled how they can support such claims. The other polycarb canister that failed due to the latches on the lid (BearVault). Maybe I am at fault here, and if I am...well, shame on me. Funny, but it looks melted to me. Maybe the bear had a phaser? Can't say I feel any safer out there with bears equipped with advanced technology. Maybe we can ask the Federation to intervene. Looks like a bite to me. Bottom teeth get a grip on the bottom of the plastic, top teeth apply awesome pressure.... and voila! Goodies are gone. Bear doesn't care if his gums bleed a little. I just got a Lighter 1 and can't say I feel great about that photo. From now on I'm going to use mine for a pillow! I sent the company a link to this thread. LIGHTER1 has been approved by the Interagency Grizzly Bear Committee (IGBC) for use in the National Parks. It has been individually approved by such parks as Yosemite, Denali, Sequoia, Kings Canyon (SEKI), Glacier, and Rocky Mt. National Park. Made in the USA. Thanks for detailed pictures. Sorry you had to be the subject of this bear's (successful) experiment. I know of two brands, BearVault and and Lil' Sami, that offer bear-canisters made of polycarbonate. Both use a narrow concentric depressions, "channels", to strengthen the sidewalls. BearVault calls them "retention guides" for straps used to attach the canister to one's pack. These guides are located mid-height and well away from the top and bottom. Lil' Sami's canister has three channels. Two of the three are fairly close to top and bottom of the canister. By "close" I mean "biting/clamping distance". Canisters made of ABS have stiff sidewalls and don't need reinforcing channels. They offer no purchase for a bear's teeth. If you examine this photo, you can imagine how a bear's jaws could clamp down on it. Picture how a bottle opener works. Top teeth bear down on the canister's flat surface while bottom teeth hook onto the channel. Now pry upwards like a bottle opener. Keep doing this until teeth puncture the polycarbonate (you can see dimples on the top attesting to that) and allow for an even better grip. Eventually the material fractures and can be torn away, piece by little piece. All you need is a persistent, resourceful, and hungry bear with an entire evening available to dedicate to this project. Marcy Dam has 'em. Apparently the Lighter1 is good for one thing... the bear! Bitten and clawed up, but never opened or damaged. That shows evidence of the same "bottle opener" technique. The big difference is the canister has smooth walls with no channels. There's nothing on the walls for the bear's lower teeth to grip. Just enough purchase to make a few impressive gouges on the top with his incisors but not enough to puncture/crush/fracture/tear the ABS. Yep - and the side had a few claw swipes...he got pretty angry at it, was almost funny listening to him growl and stomp and bat it around. This was the first trip using this bear container. Up until then, I used a Garcia Backpacker's Cache (the model for rent at HPIC). I haven't had a single bear versus bear canister event until this. Maybe the recognize the iconic look of the Garcia as a no-go. Unfortunately it's heavy and big. It might be a decent option. The only thing that might be concerning is the size. Not sure if it can fit in bears mouth or not. 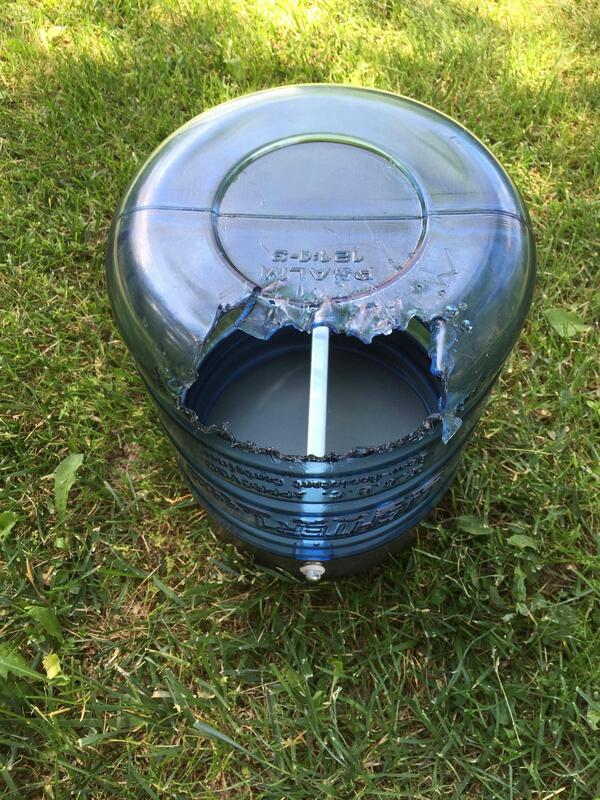 How can anyone expect (basically) a plastic water container to resist the efforts of a bear?? They open car trunks with their claws, rip off nailed down window and door coverings. Hang your stuff so high that the bear can't reach it. were the missing pieces of the container found at the scene? I couldn't find the missing pieces of plastic. I cleaned up as much as I could when I found the canister. Unfortunately I counted up the number of wrappers and containers, and there is quite a bit still missing. I am going to try to head up this upcoming weekend to try to find it. I couldn't find the missing pieces of plastic. ... I counted up the number of wrappers and containers, and there is quite a bit still missing. I am going to try to head up this upcoming weekend to try to find it. I think they'll be relocated to wherever the bear poops them out. I think it is possible to make a bear-resistant container out of polycarbonate. The BearVault is made of polycarbonate and it's Achilles Heel is its lid and not the container itself. Apparently dear departed Yellow-Yellow figured out how to depress both locking tabs and remove the lid. Or possibly just pry it off, bottle-opener style. The weak spot in the Lighter 1 appears to be the location of the reinforcing channel. It effectively makes the entire bottom look like a giant bottle-cap to a bear. I'm not sure why no one makes a Garcia-clone from polycarbonate. It's possible the material would have to be thicker (to create smooth walls without reinforcing channels) and end up weighing as much as one made from ABS. As for bear-hangs, well you know, they're not allowed in the Eastern High Peaks zone. That's a response to a long history of food lost to wily bears. They learned that slashing taut parachute cord results in supper falling out of trees. No excuse for the canister failure but bears are always a problem in populated camping areas like Marcy Dam, Flowed Lands, etc.. Which is why there is a canister rule for the Eastern Adirondacks. Bears definitely learn how to deal with things to get to food! The most effective canisters are big and heavy, unfortunately. But I think we are stuck with them. I think the reason that bear hangs eventually stopped working in the Marcy Dam / Colden corridor was the large number of poorly done hangs. Back in the day when bear hangs were allowed, I would often see food hung 5' in the air over the trail (yes, 5'; I had to duck under it while hiking through). This is what trained the bears. If everyone had done good high hangs per guidelines, we might still be able to use hangs. It's kind of like the development of antibiotic resistance as a result of incomplete courses of antibiotics. Similarly, poorly designed canisters are a concern. More bears get trained that if they just work hard enough at it, they can get food from canisters. This may eventually put even the sturdy canisters at risk. I am convinced that what initially lead to the bear problem in the High Peaks was not poor hangs or improperly stored food at night, but groups leaving food unattended in the site during the day while they were out climbing peaks, and leaving behind messy campsites when they departed to return to civilization. Bears have a natural aversion to humans, and I don't think that improper night time food storage alone would be enough for them to overcome this aversion. In other backcountry areas of the Adirondacks, I am always astounded by how often I come across occupied but unattended campsites with food just left out in the middle of the site. Often it's human food, but I also see a lot of bowls of dog food left unattended in sites while groups are out day hiking. And at popular campsites, I frequently see a lot of discarded food and trash left behind after groups have vacated the site. Fire pits filled with everything from used tea bags to extra hamburgers/hot dogs to egg shells, sites with plenty of food scraps and crumbs scattered around (and don't get me started on pistachio shells, those things never degrade). Lean-tos filled with food, not just canned goods but condiments like ketchup, mustard, peanut butter, jelly, etc., as well as instant meals like ramen noodles and knorr pasta/rice sides. And, of course, trash- discarded food wrappers, empty beer cans, etc. And on top of that, you get groups that don't understand how to properly wash dishes and dispose of food scraps (carry them out) and gray water (disperse in the woods across a wide area far away from the campsite). I imagine that prior to stricter regulations and increased enforcement of food storage regulations in the High Peaks, conditions were likely similar there (I only camped in the High Peaks a couple of times prior to the bear canister regulation and it was well before I was aware of such issues). Once bears started to make the association between campsites and food (due to ease of access to that food in those sites when no humans were around), they got bolder and bolder and lost any natural aversion they may have had. Improper nighttime storage of food certainly didn't help the situation any once that association had already been made in the bear's minds, but I really don't think it played a major role in instigating the situation to begin with. I'll admit that I don't always do a bear hang for food storage at night when camping (in areas where I am confident that there is not currently an issue with bears or other wildlife), but I do place a strong emphasis on keeping my site as clean as possible, avoiding spilling any food and picking it up if I do, and properly disposing of food packaging and waste. I do also always use a hang if I'm leaving camp during the day and will be leaving food behind. Last edited by DSettahr; 06-28-2016 at 02:59 PM..
Yeah... I would expect to find the missing pieces somewhere in the woods- which would indeed prove the old adage.